The Laramie Project cast. 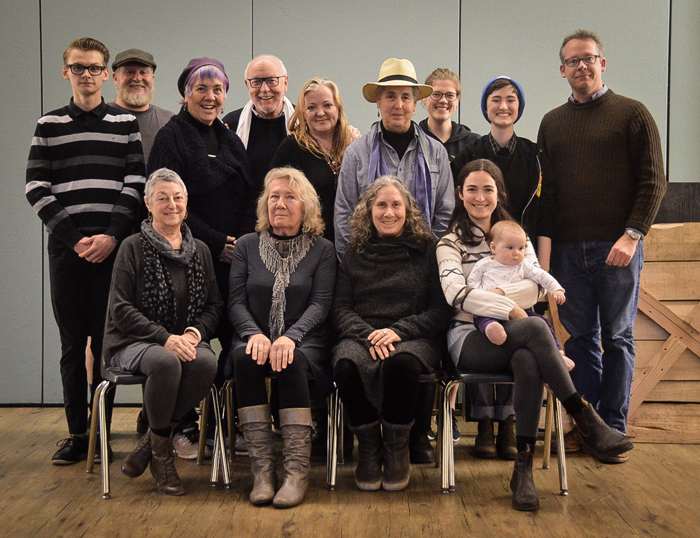 Back row, from left, Kevin Gray, Bob Twaites, Lisa Dahling, Bill Turner, Shellyse Szakacs, Corrie Hope Furst, Jesi Pearce, Kane O’Scalleigh, Jason Donaldson (director). Front row, from left, Joi Freed-Garrod, Lynda Jensen, Wendy Judith Cutler, Metta Rose with baby Rica. In 1998, on the outskirts of Laramie, Wyoming, a 21-year-old gay college student named Matthew Shepard was brutally beaten, tied to a fence and left to die in the frigid night. The shocking events ripped through the social fabric of the university town and around the world. Shepard’s name became a tragic reminder of everything wrong in society and an emblem for change. His story was immortalized by New York’s Tectonic Theatre Project, who created The Laramie Project based on more than 200 interviews they conducted with residents, family members, police and others. The resulting play with its multi-layered perspectives gives audiences the opportunity to take a tough look at local acceptance and discrimination. Salt Spring Island is just one place across North America where the Laramie Project has been performed, with the WordPlay theatre group, members of the queer community and Gulf Islands Secondary School students coming together for a performance directed by GISS theatre teacher Jason Donaldson in 2006. A similar collaboration with Donaldson at the helm will bring The Laramie Project: Ten Years Later to ArtSpring for one night only on Saturday, Feb. 17. The staged reading asks what has really been learned from the murder and its aftermath, based on interviews the original theatre troupe did one decade after their first trip to Laramie. Wendy Judith Cutler and her partner Corrie Hope Furst were part of the 2006 reading as newcomers to the island, and Cutler has been key to staging the upcoming companion piece. She says the key question the second play attempts to answer is how a community responds to violence. Speculation circulated around the true motives of Shepard’s two killers, but their original defence included their disgust that Shepard was gay. Their convictions eventually led to much-needed hate crime legislation and new conversations across society, but as the Tectonic Theatre troupe learned on their return visit, a strange tendency to disavow a hate crime had edged into Laramie. After 10 years, many people wanted to let it go and move on, while others insisted drugs were the only factor. Kevin Gray, a Grade 12 student from Pender Island who appears in the Feb. 17 reading, was not yet alive when Shepard was murdered. Gray said no one he knows who is his age had even heard Shepard’s name. For Gray, just bringing awareness to the murder and its context in history is an important aspect of the reading, as well as the opportunity to work with people from other parts of the community who do have personal memories and knowledge of those events. Metta Rose was drawn to the project after recent appearances in musicals such as Cabaret and Spamalot. She was living away from Salt Spring when The Laramie Project was staged in 2006 but saw another version at UBC that has stayed with her. “I was drawn to it and wanted to be a part of it, and being part of the community and the collaboration between the high school students and everyone else. It’s just a really great way to do theatre, so I didn’t want to pass it up,” Rose said, despite having a nine-month-old baby in her arms at the time. To Rose, Salt Spring seems a bubble of love with few haters, but she feels it’s still important to have conversations and bring difficult ideas into the light rather than have them fester unnoticed. “It’s hard to imagine something like that happening here, but I’m sure they thought the same thing [in Laramie],” Rose said. The wide cast of characters involved in The Laramie Project presents the opportunity to relive events from a wide range of perspectives. Gray plays an out-and-proud friend of Shepard in some scenes, and one of the convicted killers in others. It’s the second role that has proved the most difficult to relate to. “To play someone who did something like that — it’s a challenge to get into that mindset . . . I can’t even comprehend the pure hatred they had for people. It’s scary,” he said. Cutler said ArtSpring’s near-capacity crowd in 2006 appreciated having the staged reading rather than a full theatrical performance, as the words of the people involved were allowed to be the focus. She also feels that bringing people together in person is a powerful mechanism for change, which is what the social justice theory of theatre is all about. The evening will conclude with a talk-back session guided by Robert Birch. The cast is just as excited to hear what comes out of that experience as they are to present the material that will inspire the conversation. They hope to get a full crowd to make the conversation a good one.